How to win at Video Poker - a basic strategy. The proper strategy for beating Video Poker depends on learning some basic rules and being very disciplined in applying them. This isn't as easy as it may sound as some of the rules will go against your Poker instincts e.g. keeping 2 Threes instead of A,Q. Trust these rules - they'll give you by far your best chance of beating the game! NB as discussed in our Video Poker player's guide, this strategy is designed around the most popular Video Poker game - Jacks or Better. Once you're familiar with the optimal strategy for Jacks or Better, you can adapt it to suit each Video Poker variation, with only minor changes. 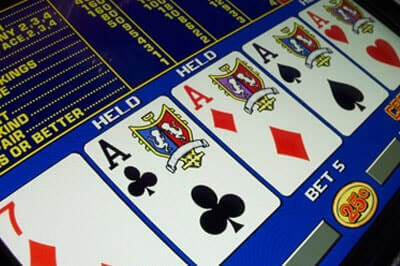 Although the hands are ranked in the same way as, for example, Texas Hold Em, it's important for new players to remember that Video Poker is not the same as 'real' Poker - whereas in Poker you're looking to beat other players, in Video Poker, all you need is a hand that qualifies for a payout. It's this point that leads most players into making mistakes. Just like in Blackjack, there's no shame in winning on a low score, or with a hand that probably wouldn't win a game of Texas Hold Em - all you have to do is get a winning hand! Regardless of any other strategy you use, you need to remember that the highest payout in Video Poker comes from hitting a Royal Flush when playing 5 coins. The difference in payouts between 5 and 4 can be huge (4,000 to 1, instead of 1,000 to 1) For this reason, you should always play five coins per hand. Bovada Casino are offering new players 3 deposit match bonuses up to &dollar;1,000 each, that you can use on Video Poker! To make this strategy easy to use, we've divided it up into sections, each one dealing with the number of significant cards in the hand you're dealt. We then advise you on what to do - and what not to do! For example, if you're dealt K♦, J♥, 9♠, 3♠, 3♥, you should look under the '2 card hands' section (as the two 3s are the most significant cards) and read the instructions under do and do not. If you're dealt Q♠, J♥, 7♣, 6♣, 3♣, look under the '3 card hands' section (as the Clubs are the more significant cards). Some hands may come under more than one category e.g. A♦, A♣, J♠, 10♠, 9♠ comes under '2 card hands' (pair of Aces), '3 card hands' (3 to a Straight Flush) and also the 'How to rank hands' section which tells you how to separate confusing hands. NB in all cases, High card = Jack and higher, Low card = 10 and below. Hold three suited and connected high cards (10, J, Q or higher), unless you also have a High pair. Don't hold 3 suited low cards (lower than a 10) if you also have a pair (high or low). Hold a 4 card open-ended straight (connected, unsuited cards) unless you also have a pair (high or low). Break up a 5 card straight or flush if you have a chance of a Royal Flush. e.g. if you had 8♦, 10♦, J♦, Q♦, K♦, discard the 8 and hope for the A♦. Waste money on a lost cause! 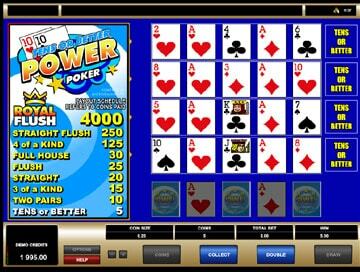 Check out the casinos below for the best Video Poker games currently available. Video Poker is one of the simplest and most popular games in the casino, and for good reason - it's easy for beginners to learn, but offers experienced gamblers the opportunity to employ a strategy that could give them the edge over the casino. A simple guide to playing Video Poker. 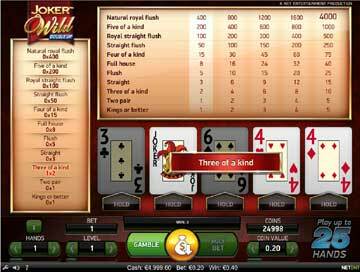 An explanation of the rules, game mechanics and an overview of the different Video Poker variants you'll come across. 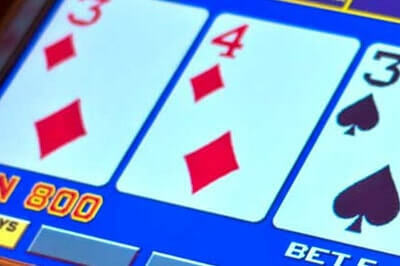 This Video Poker Basics guide is designed to get you up and playing in as short a time as possible. Practice your new-found Video Poker strategy skills on this free play game which you can play without downloading, on your mobile, tablet or desktop. You'll get 3,000 play money credits and as long as you want to practice!